There is no better way of celebrating a spring wedding in Namibia than with this striking colour combo. It effortlessly combines the grace and joy of a wedding celebration. A striking combination that shouts for a love celebration! Balance your grey with your yellow and you will find the perfect blend to create a look that is both sophisticated and fun. Dial up the yellow to bright canary add some green to amp it up even more. Or dial it down for a softer sun kissed yellow glow, whatever you decide this is a wonderful combination. Bouquet & Flowers: Combine yellow Tulips, Daffodils, Roses, Mini Calla Lilly or playful Gerber Daisies and sunflowers with readily available Namibian grey succulents. Bridesmaids Dresses: Grey is wonderful colour which always serves as a great combination with any colour. Dress up your grey dresses with yellow shoes or posies. Groomswear: Once again yellow All Stars all the fun and pop of colour complimented by a classic (wear again) white shirt grey tux and yellow tie. Or add a pop in socks. 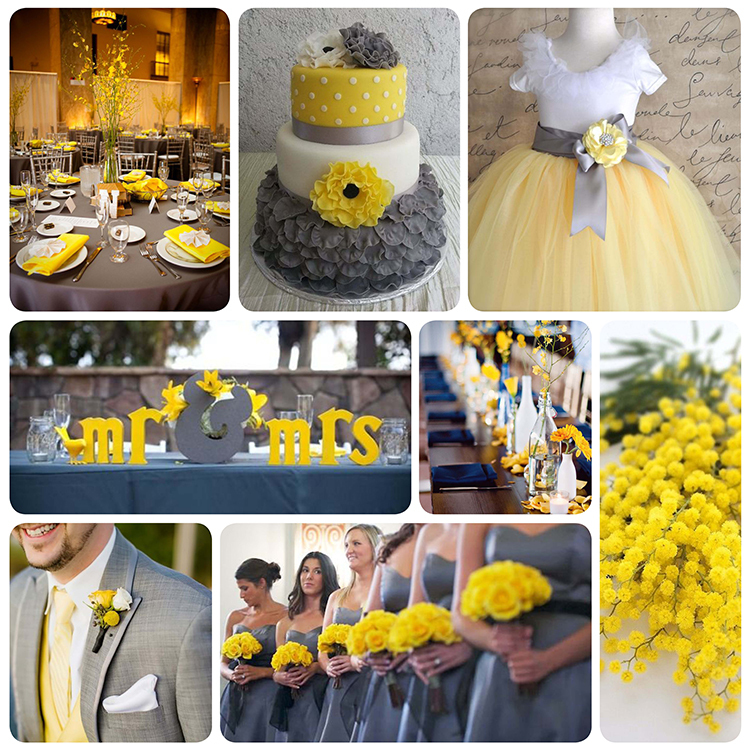 Décor: Grey tablecloths, silver cutlery combined with a pop of yellow in your centrepieces or serviettes. Add that playful element with over-sized white, grey and yellow paper flowers. Ceremony: Walk down an aisle of fresh green grass and yellow petals flanked by white beach chairs and a view of the ocean. Cakes: From simplistic to flower prints. For more inspiration, original images & credits visit MyBigDay on Pinterest.